Another week has gone by and it is time for another dose of posts that I read from my Feed.ly Reader. It is starting to grow on me after being used to Google Reader for so long. There are several features that I am still getting adjusted too, but so far Feed.ly is working out just fine as a replacement. 1.) 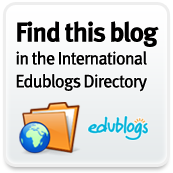 So....You Wanna Use Blogs in the Classroom is a great introduction post to learning about blogging in the classroom. More and more students and teachers are turning to blogs as a way for students to write and then publish their writing. From the Blogging About the Web 2.0 Connected Classroom. 2.) 12 Ways to Integrate (Not Just Use) Technology in Education from Edudemic provides a chart showcasing the differences between Using Technology and Integrating Technology. 3.) What is the Role of the Librarian is a great post for helping all of us Educators remember the importance of the Library in the school system. Google has definitely changed how research is done, but utilizing the library and the librarian is still very important. From Educational Origami. 4.) 17 Awesome Google Chrome Extensions interested me as I have finally made the switch over to Google Chrome for my everyday browsing. There are several extensions that could be very important for educators inside and outside the classroom. From A Media Specialist's Guide to the Internet. 5.) 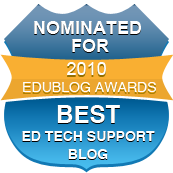 StudyBlue Announces Annual Teacher Appreciation Program "Thank a Teacher a Latte" is a post from Educational Technology Guy that helps to explain the program and how students, parents, and other stakeholders can get involved in thanking a teacher our our ever important job. EntourageBox is a service that allows users of DropBox, Google Drive, and Amazon S3 to share their account with friends (or in educators cases fellow teachers or students) so that they can upload files to your cloud storage. By using EntourageBox you are giving access to others to a public folder within your cloud storage where they can upload files. Using the service is very simple. You just choose your cloud storage service, allow EntourageBox to connect with your cloud storage service, and then choose or create a folder that you want others to be able to upload too. After that, the service will generate an upload URL that you then share. For security, you can provide a password as well if so desired. You also can deactivate the URL at any time, so if you wanted to use it for a single upload you could. The service is completely free. I could see teachers utilize this service that use Google Drive as a way for students to submit assignments or projects. Principal's could use it as a method of collecting lesson plans or meeting minutes from committees and departments. EntourageBox could be very helpful in removing the clutter from emails with attachments. AppoLearning is a resource for teachers looking to learn about the best educational iPad apps available. Experts on the site evaluate and score apps across grade levels and through multiple categories to make finding an app even easier. Apps are scored based upon Educational Content, Kid Appeal, Assessment, Features and Design, Value, and Safety and Privacy. Users can look for apps from early childhood through high school. If a category is unavailable, users can also request one. There is an app of the week and a blog that can be followed to learn about other educational technology interests. Each app provides scores, content information, and a direct link to the app on iTunes. If you find yourself using an iPad in the classroom a lot and think you could become an expert, the opportunity is also available to do that. If looking for an iPad app for your classroom, give AppoLearning a try. Many educators are taking to Twitter as a method professional learning and also for communicating with students. One of the issues is that if you wanted to mention several people in a tweet is that those mentions take up your 140 characters. The other issue is that if you want to send a direct message to Twitter users, you can only send one at a time. Fliite is a new option that will soon be available for the iPhone that allows users to group message/mention multiple users on Twitter. Fliite could come on handy for those teachers that utilize Twitter in the classroom. You can sign up to receive an email notification when it is available, but it seemed promising, so I thought I would share. You can see the video below for more information. With Google Reader getting ready to be gone for good I have permanently switched the blogs I follow over to Feedly. I hope to regularly bring you some of the great information shared across the web from other blogs that I follow. Here are some from this week. 1.) 50 Digital Storytelling Websites and Apps from the Technology Tidbits Blog. The list is available in alphabetical order which makes it easy to discover sites and apps that you might not be familiar with. 2.) Dealing with Dashboard Decisions - I don't really use them myself, but homepages that mimic a dashboard look are popular for many people. This post provides a great list of options. From The Never Ending Search Blog. 3.) The Bammy! Awards - An Award honoring the Education Community from A - Z. You can find the nominees HERE. 4.) 89 Cool Sites, Apps, and Tools for Teachers from the Cool Cat Teacher Blog has a great list for teachers looking to integrate technology into the classroom. 5.) 21 Reasons to Stop Saying 21st Century Teacher from the Free Technology for Teachers Blog makes a great case for removing this terminology from describing teachers. I wrote two eBooks called "Tools for the 21st Century Teacher" (1st Edition and 2nd Edition) and looking back, a more proper name probably would have been "Tools for Today's Teachers." I have to agree with a lot of what Mr. Byrne is saying in this blog post. We are teachers and this is the 21st century, so naturally we are all 21st century teachers.